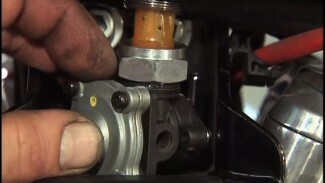 Bob installs a chrome HHI front caliper. This HHI caliper allows the rider to lock their front tire for security and provides superior stopping power. 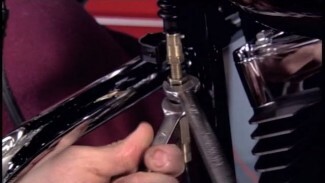 Bob removes the brake line and sets it over a drain pan. He removes the stock caliper and cleans his work area. Bob checks the new caliper parts to make sure they are all there for perfect installation. He makes sure the caliper is aligned properly and torques the bolts. A custom banjo bolt and washers come with the new caliper for the brake line installation. Bob tells us to make sure we have brake lever feel by bleeding the brakes.